Ok, so it can’t be too hard to work out what inspired this Blog post: the middle way that is secure, and ( I can’t believe I’m actually going to write this…) strong and stable. Who says Exercise Instructors can’t make political jokes eh? So leaving the Body Politic in return for the, well, Body……. what is this Neutral malarkey? Does it matter? Can we all agree on it? There are two different definitions for the two different entities that are the spine and the pelvis. They are interlinked and each influences the other. Neutral spine is the position where the bones of the spine, the vertebrae, are aligned so that there is maximum congruence and minimal strain across the joints. 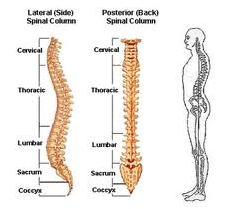 That is manifested in the classic “S” shape that is familiar to us from pictures of the spine or the skeleton. It is really important to remember though, that humans are not static creatures. We are built to move about – all day and every day, so that we don’t live much of our lives really with our spine in neutral. Can our bodies regularly maintain a neutral spine if desired? Possibly not. Why is neutral spine tricky to achieve? Issues with bones and muscles caused by too much sitting down, too little movement, too little physical work in the body, poor posture. If maintaining neutral is tricky because of poor posture, then we can definitely have a crack at remedying the situation by adopting simple solutions which we can bring to bear on the body all the time. These are relatively simple things and ones we kind of know we should do….! take care to ensure that the head is not poking forwards. This disturbs the cervical spine (neck). Neutral matters, not because it is some kind of magical position of itself, but because of the fundamental, vital role of the pelvis in our movement. This is pretty much all movement but definitely in running, walking squatting, stair climbing, sitting. The base of the spine dovetails with the pelvis and so neutral pelvis will influence neutral spine and vice versa. The pelvis is much more contained than the spine. You can put your hands on it, feel it and move it. Especially when lying down you can move it around and feel those movements. Rather than give pictures, or a description, here is a clip to show you what Neutral looks and feels like. Our body does not automatically sit, lie or stand with a neutral pelvis and it is fairly common for the pelvis to be in a rotated position Why? You can probably guess: bone stuff, tight muscles, weak muscles, sitting to much, injuries, falls. In addition, having a job involving asymmetric repetitive moments, pregnancy, sitting down too much thus weakening some muscles and tightening up others. Neutral should be easy, not require much effort or thought. That it isn’t is because of lifestyle factors. We need to think about neutral and apply ourselves to it cognitively, we should practice the use of neutral through corrective exercise, through plenty of stretching, through mindful standing and walking. To conclude: it’s a position of strength and stability. A bit Vanilla, but not everything in life can be exciting. It’s ok to have neutral territory: the spine and the pelvis need a place of safety too.